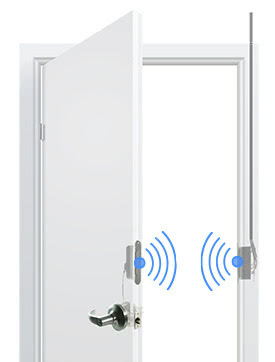 The WPT uses a radio frequency (RF) transmitter to send energy wirelessly across the door gap to a RF receiver that converts the energy to DC voltage - to power electrified locks and latches. Retrofitting electrified locks into openings with existing wood doors is simpler and less time consuming – core drilling the door is not required. Works well with steel doors, too. 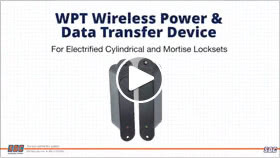 Plus, unlike competitive wireless power transfer devices that use magnetic induction for the power transfer, the WPT’s RF technology* also allows for transfer of latchbolt monitoring, REX or data signals. 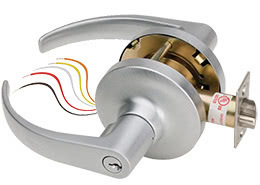 The WPT eliminates unsightly, exposed wires across the door gap that are susceptible to vandalism or breakage thru use and includes a timed trigger to allow for up to 90 seconds of sustained voltage, if required. 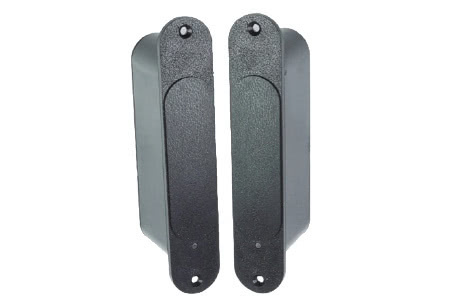 The WPT transfers power wirelessly across door gaps up to 7mm (a little over 1/4”), and provides more tolerance in lining up the transmitter and receiver vertically and horizontally than inductive power transfer devices. 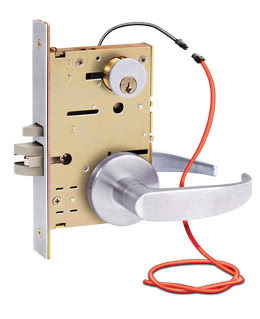 Perfect for powering, monitoring, controlling or communicating with electriﬁed cylindrical or mortise locksets.